Construction of Apple Campus 2 is well underway with a launch date set for the end of next year. 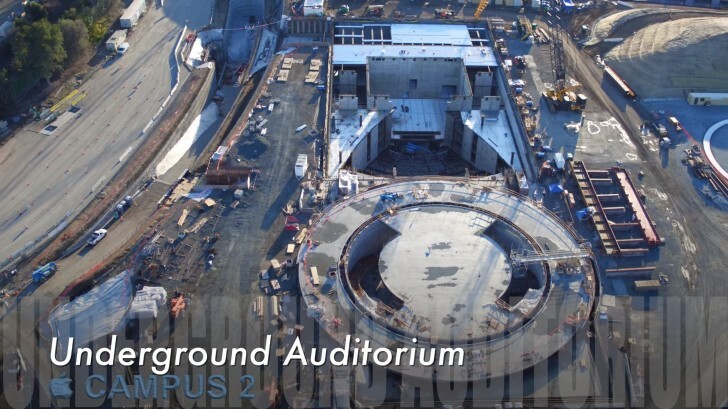 In his customary monthly aerial video photographer Duncan Sinfield gives us an update on how Campus 2 is progressing and reveals an undeground auditorium in the making. The giant circular complex is shaping up nicely, and parts of it are already waiting for the next phase of development when the glass panes will be put in. A view from Mt. Apple gives a glimpse of how the whole thing will look from the ground, sort of. Next to it is the said auditorium, which in its finished state will be below ground and thus away from prying eyes. The tiered venue will accommodate future product announcements and other key events. The R&D facility named Tantau is also coming together, now 3 to 4 levels up. You can view the video below and listen to the man himself Steve Jobs and snippets from his 2005 Stanford speech. they r just making up things, they don't actually plan on building it... apple the Pretender.... how sick! Alright really $100 million Wozniak, together with Steve Jobs, founded Apple in 1976 has an estimated net worth of $100 million and was responsible for the company's iconic fruit logo.